A Soc and Bob's girlfriend. Cherry is open-minded, sensitive, and courageous. She befriends Ponyboy early in the novel and helps him to see that Socs are people, too. After Bob dies, Cherry plays a minor role as a liaison between the two gangs. Ponyboy always keeps in mind her contention that, despite the superficial differences between them, the Socs and greasers see the same sunset. The timeline below shows where the character Cherry Valance appears in The Outsiders. The colored dots and icons indicate which themes are associated with that appearance. Fogt, Lis. "The Outsiders Characters: Cherry Valance." LitCharts. LitCharts LLC, 22 Jul 2013. Web. 10 Dec 2018. Fogt, Lis. "The Outsiders Characters: Cherry Valance." LitCharts LLC, July 22, 2013. 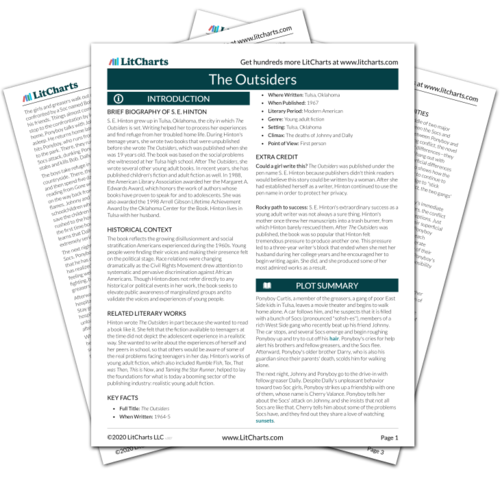 Retrieved December 10, 2018. https://www.litcharts.com/lit/the-outsiders/characters/cherry-valance.